Affectionate touch is something we all need as humans. Even animals benefit from healthy touch. Plenty has been documented on the effect of bodily contact with newborn babies. In this article, we’ll delve into reasons that touch is important in early childhood. We’ll also give ideas on how you can incorporate affectionate human touch in your relationship with your child. And, we’ll discuss how the need for human touch can be facilitated in a healthy way by child care centres. As this article states, nothing can replace affectionate touch in the early years – not even nourishment or schooling. Touch is an essential human need. It affects brain development. Healthy caressing and gentle touch are reported to help a young child identify their own selves. This may lead to conclusions about body image disorder; healthy touch may be a link to preventing these internal issues. For children who spent their early years in orphanages, studies showed that the absence of affectionate touch in those situations led to higher stress and increased negative social behaviours later on in life. The mental development of a healthy child starts at infancy, where they learn they have a cause-and-effect relationship with their mother. However, there is some indication that affection can reverse, to some degree, any negative effects of not having that initial bond with a caregiver early in life. In helping to promote healthy childhood development, both physically and mentally, touch has been studied as being crucial – even if only for 10-20 minutes a day (as studied on babies). For infants, babies who were stimulated with affectionate touch outside an incubator were able to even grow more, physically. It’s also been noted that even in adults receiving massages, blood pressure is reduced, and so is anxiety. So there is no doubt that healthy touch can affect physical health. The flip side of the above benefits of touch can also been seen. A study that tried to look at the effects of touch not just in infancy, but in childhood, found that negative, or aggressive touch could also cause stress in a child. To quote the aforementioned link, “specifically, it may cause children to suffer from internalizing psychological adjustment problems.” This is serious because how children are touched needs consideration – not just the fact that they need to be touched more affectionately. Depending on the age of your child, try holding hands when going for walks or heading out of the house. Rub their back or stroke their hair for no reason. During bath time or getting ready for bed, it’s ok to have some tickles and smooches (as long as they’re welcome, of course!). Hold their head or cheeks when you kiss them. Hug them when they come home or when you haven’t seen them for a few hours (like when picking them up from daycare). Put your arm around them when reading a book, or cuddle up together on the couch or bed. Let them sit on your lap and hug for a while if they’ve just been through something tough (a scrape on the knee, an ‘I’m so tired’ tantrum, a fight with a sibling, a bad dream, etc.). 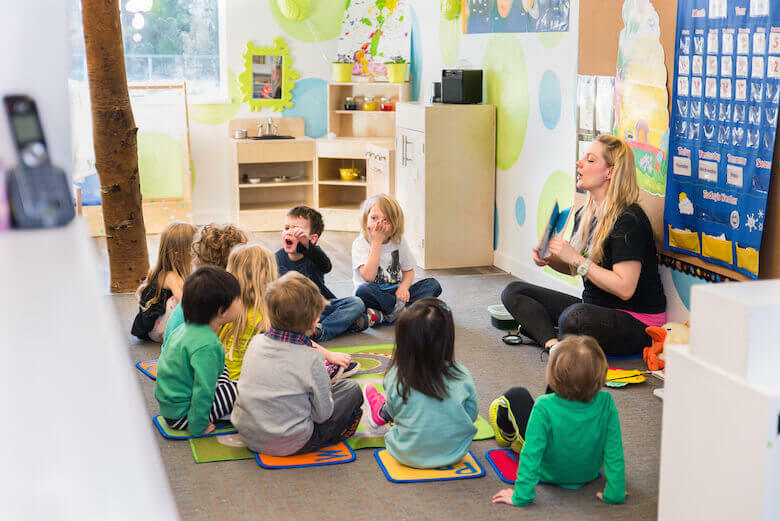 According to an article on the PennState Extension website, human touch in child care centres should be encouraged, not discouraged. This makes sense, since children can spend a lot of time in preschool or daycare environments. Having them miss out on the benefits of human affectionate touch simply because they are in child care would be a shame. Ensure they only use touch in the presence of other child care workers or staff. Policies can be in place and standardized during staff training to ensure they are carried out. As a parent, you shouldn’t be afraid to ask what the daycare’s touch policies are. Set clear limitations on touch that everyone in the daycare centre is aware of, including families of the children. For example, policies like: only being allowed to touch hands, giving hugs with arms around the shoulders, no touching tummies, etc. Educate children on the differences between healthy and unhealthy, or inappropriate touch. This also spans into interpersonal relationships between the children in the classroom, where discussions on hitting, biting and grabbing can also be discussed. For example, “how does it feel when Molly pulls your hair? Do you like that? How come?”, “Is it ok to bite Ben, even if you’re playing? Does biting hurt?” More on this topic can be read about here. Ask parents if there are limitations on how their own children may be touched. Alternatively, notify the parents of the daycare’s touch policies. The article linked to above also states that criminal background checks should be done on all daycare workers. This should be a given in any professional daycare centre. If any daycare centre worker notices extreme fear of being touched when interacting with a child, this should be addressed as an individual case. It can be indicative of a mental disorder, or indicative of possible abuse in the home. Daycare workers should be trained to handle such cases, or bring them to their superiors. No matter who is responsible for the child, touch needs to be considered as importantly and prominently as healthy nutrition or education. As this Quora contributor has written, “Overall, touch is important because it can help soothe a child, teach that the world is safe, and that they can trust others to ask for help.” But not touching, or not hugging a child for instance, while they are young, can instill a fear of the world. Or, it can cause them to devalue themselves and their needs. It is clear in our own experiences, even as adults, that affectionate touch is enjoyable. At least it should communicate feelings of love, safety and comfort. Some people don’t like to be touched, and that’s fine. But the understanding of touch as a human need, especially in childhood, is relatable. Science confirms that hugs, for instance, release oxytocin in our bodies. This is a hormone that allows to feel a sense of bonding and the ‘goodie feeling’ we get from a hug. So, it may be worth benefiting from the ever-huggable children while they’re young – their touch can do you some good too!